As a young man, Rubens made many copies of sixteenth century paintings, but only a small number of them have been preserved. 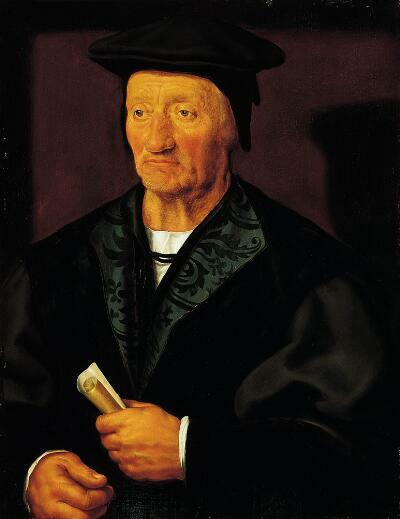 This portrait of an elderly man dressed in a black hat and cloak is a copy of a painting by Joos van Cleve (c.1528) which is now in the Prado Museum in Madrid. Rubens' copy shows his characteristic streaky preparation of the under layer, clearly noticeable under the surface of the face, as well as his free brushwork and warm colors. The solidly painted hands and costume suggest an early date, perhaps before Rubens left for Italy in 1600. [Julius Weitzner, New York, until at least 1955].